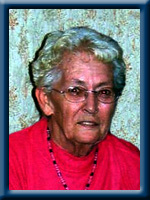 ANDREWS – Madelyn L., 80, of Liverpool Queens County passed away peacefully in Queens General Hospital on August 2nd, 2010. Born in Broad, Cove, she was a daughter of the late Aden and Ola (MacLeod) Smith. Madelyn was a member of the Ladies Auxillary of the Mersey Branch #38, Royal Canadian Legion, Liverpool and the Nova Scotia Guides Association. She enjoyed playing league bowling and darts as well as knitting, sewing and “watching her hummingbirds”. She is survived by her daughters: Cheryl (Harry) Kennickell of Liverpool and Catherine (Adriano) Arcieri of Toronto, ON. Her son Thomas (Linda) of Innisville, ON, 7 grandchildren and 7 great grandchildren. Her sisters: Helena Wentzell of Liverpool and Meleta (Albert) Hirtle of Tampa FL. Her brother St. Clair (Rosemary) of Martin’s Brook. Her long time friend and caregiver Barbara McLeod. She was predeceased by her husband Roderick. My heart goes out to you and your families as you grieve the loss of your mother (grandmother). Madelyn was a special lady and a dear family friend. She will be missed by many. I know your hearts are heavy with sorrow May your hearts and spirits be lightened knowing your Mom is now at peace with God, her suffering over. May loving memories help you as you walk this difficult road. My thoughts and prayers are with you all. If there is anything I can do to help in any way, please don’t hesitate to call. Sorry to hear of your mothers passing. It’s such a sad time for you… our prayers go out to you in the hope that your good memories will get you though this difficult time. Another angel gone to heaven! My thoughts & prayers are with the Andrews family. Madelyn was a wonderful person. Always had a smile for everyone. She will be missed,but she is with Roddie once again & they are probably sharing a “joke” or two. Happy together once again. Your Mom was a very special lady and she will truly be missed by all who knew her. We hope it helps to know how much others care. We wish you strength at this difficult time. Gone from our sight but never from our hearts. Your Mom was a very special lady and will truly be missed by all who knew her, especially her friends at Mersey Place Court. We wish you strength at this difficult time and hope it helps to know that others care. Gone from our sight but never from our hearts. Cheryl, Cathy, Tommy and families….I was saddened to hear of Madelyn’s passing. She will be missed by many, but not forgotten. May you find comfort and strength in one another and in the friends that surround you during this difficult time. My thoughts and prayers are with you. We are so sorry to hear of the passing of Aunt Madelyn. She will be missed. Please know that you are all in our thoughts and prayers. My thoughts are with you during this difficult time. Take care of each other. To the family,I am so sorry to here of Madelyn’s passing. I have know her for many years and talk to her often.She will be missed. So sorry to hear of the loss of your mother. Our thoughts and prayers are with all of you. We are so very sorry to hear of your mom’s passing. Our thoughts and prayers are with all of you during this very sad time. Remember all the good times with Madelyn. Cherish your memories. We are sorry to hear of Madelyns passing. Our thoughts and prayers are with you all. My thoughts are with all of you during this very sad time. Madelyn was a great lady and was always there to help anyone who needed her help. (I will always remember her delicious molasses cookies that were the best.) She will be missed. Cheryl and FAMILY, so sorry to hear of your mom’s passing just want you to know you are in our thoughts and prayers. so sorry for your loss may god be with you in your hour of need.she is in gods hands now. So sorry to hear of your loss, Madeline was so kind to accept me into her home on week ends with I came to town, during my high school yrs, and stayed @ her house, Cathy and I being good friends. We shared some funny moments!Take strength in one another, remember the good times, they will see you through the rough ones!! I became very fond of Madelyn as i got to know her from working at hanks,many a night she kept me company,and some of those i learnt what a wonderful cook she was. God bless her. So very sorry to hear of Madelyn’s passing.We know she will be missed but remember the good memories,they will help you through the bad times. Cheryl,Tommy ,Cathy &’ Families,Sorry to ear of your mother and grandmothers, passing. Treasure all the wonderful times you spent with her .If you were somewhere Madelyn was ,you would hear her laughter before you seen her . She is with our Heavenly Father and at peace . Rejoice in the time you had with your mom Gods, Blessings and Peace be with you . TO THE ANDREWS FAMILY,I am so very sorry to hear about madelyn. I will always remember her & never will forget her either. She always made me smile . &she was very caring &kind. I will always remember her when she had went to mom&dads, MR.&MRS.ROBIE&MARG FREEMAN. SHE MADE THE BEST molasses COOKIES.. Please if there is anything that I can do feel free to let me know . Madelyn you will always be in my heart dear . &always love you . My throughts are with the Family. MRS. DEBBIE CARRIER. So sorry to hear of your loss. Please accept our condolences. I’ve known her since I was little girl growing up on White Point Road. She’ll be missed greatly. She always had a kind word and time to chat. I’m so sorry for your loss. Dear Cheryl and Family…….our sincere condolences on the passing of your mother. Our thoughts are with you and your family. Cheryl, Harry and Andrews family: We were saddened to hear of your Mothers passing. I so enjoyed talking to her about her recipes. I will use them and think of her. Remember the happy times and keep them in your hearts. My deepest condolences to the family. Madeline was a good friend and cb”er. Doug and I spent some good times with her and roderick. I am truly sorry for your loss. Just saw about the passing of Marilyn. I am so sorry hear of her passing she was a very good good friend of my mom (Roxie Carver/Levy). The three of us were members of the Ladies auxiary. She always had something funny to say. she will be sadly missed my heart goes out to each and every one of you. I hope mom and her are having a grand old time catching up on all the “news”. God bless you all and keep the memories close to your hearts. Sorry to hear of your Mom’s passing. My thoughts are with the family at this difficult time. We are so sorry to hear about the passing of Madeline. She was a real pistol and we are going to miss her. Our prayers are with you. sorry to hear of your loss of your mother. time will heal. sherilan anthony.